The AADC (Aperture Array Design and Construction) Consortium, working on the Low Frequency Aperture Array (LFAA) work package, has made significant progress on the detailed design, realisation and testing of all sub-elements of the SKA-low array design. This includes prototyping in the lab as well tests at the Murchison Radio Observatory. The culmination of this work will result in the building of the Aperture Array Verification System, AAVS1, and a 400-antenna large array to be commissioned in early 2016. With AAVS1 production techniques, integration and verification, this will be demonstrated on a full sized SKA station (256 elements) and 3 smaller stations. In the following sections progress of the LFAA work packages are summarised. 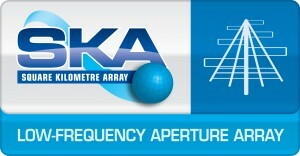 The SKA log periodic antenna has been upgraded to meet the SKA requirements. Meeting the tolerances and environmental requirements has been challenging while preserving the electromagnetic performance of SKALA-1. The antenna is now supported by 4 extended legs from a concrete base which will allow ~130,000 SKA-low antennas to survive the high wind speeds at the MRO site. The SKA-low Low Noise Amplifier has now been upgraded to reduce power consumption and improve the noise performance across the SKA-low band and beyond. One polarisation is illustrated here. The main sub-system of the signal processing located in the Central Processing Facility of SKA-low, is the Tile Processing Module, TPM. This is a rack-mounted assembly that processes the signals from 16-dual pol antennas (32-signal chains). The TPM houses the analogue signal, conditioning the reception of analogue RF over Fibre optical signals at the Processing Facility, to delivery to the ADC (PREADU board), digitisation and processing system (ADU). The primary function of the PREADU is to convert from optical back into RF and perform further signal conditioning (filtering and amplification) prior to the analogue to digital conversion. This is followed by the ADU board that provides a high performance acquiring system and by 2 FPGAs for the high-performance digital data processing (channelling polyphase filters, beam-forming and calibration). The board is equipped with low jitter clock circuits, power management devices and a small CPU for the monitoring and control of its operations. SKA1 requires over 8000 of these modules and they dominate the signal processing hardware and consequently the costs and power consumption. Both the analogue PREADU and ADU boards have been prototyped and are now being tested. KLAASA have developed and are testing an alternative prototype of the Tile Processing Module, which consists of a Receiver sub-system and Signal Processing sub-system. The frequency range of the TPM is 50MHz-375MHz and 375MHz-675MHz. The prototypes of both TPM solutions are under evaluation. The Consortium continues to gain hands-on experience with LFAA development, and is feeding this experience into the SKA design process. 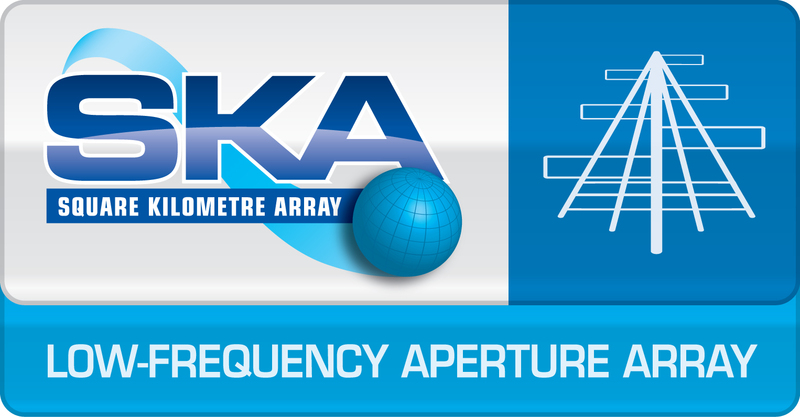 Currently deployed at the Murchison Radio Astronomy Observatory is the Aperture Array Verification System 0.5 (AAVS0.5), an engineering prototype comprising 16 log-periodic ‘SKALA’ antennas with LNAs in a pseudo-random array, co-located with the Murchison Widefield Array (MWA). 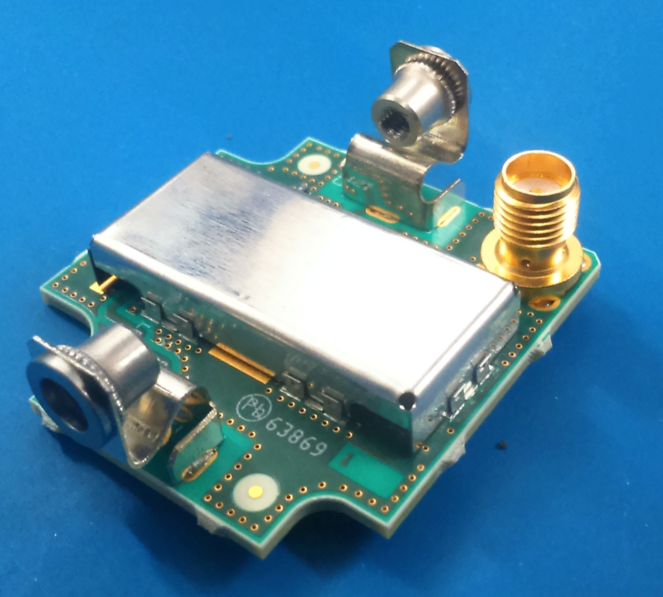 AAVS0.5 uses a modified MWA beamformer and an existing MWA receiver port to phase the antennas into an array (‘tile’ or ‘mini-station’) to use as input into the MWA signal path. This enables us to use radio interferometry with the whole MWA to measure AAVS0.5 sensitivity and beam patterns to compare with simulations. AAVS0.5, showing the 16 ‘SKALA’ antennas in the background and the modified MWA beamformer and RFoF test equipment in the foreground. Our measurements and simulations of AAVS0.5 generally show a good agreement. However, to better understand why they deviate in some areas, we are improving the calibration routines and ensuring that the simulations best represent the details of AAVS0.5 in its operational state. These results show that the AAVS 0.5-MWA hybrid approach is invaluable for antenna and array characterisation, and that we also have the capability to accurately simulate our arrays. With the demonstration of these capabilities, it gives us the confidence that we will be able to verify that the eventual LFAA design and prototypes will meet the SKA requirements. Furthermore, by using the process of verifying individual requirements with actual hardware via ‘testing’, we have gained a better understanding of how the SKA requirements are to be interpreted, and the areas where clarification would be beneficial. 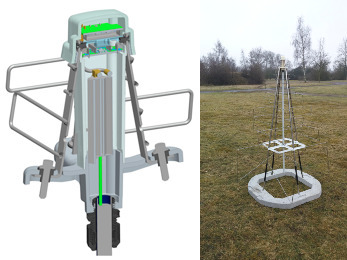 The European 16-element AAVS0 array at Cambridge has been key in continuing the developments of the array antenna for the EM simulation tools used for the design, characterization and modelling of the SKA-low station beam patterns. Below is a picture that shows the testing of AAVS0 using a UAV as a test source for pattern measurement of both embedded element patterns of individual antennas that are illustrated and array patterns. The hexacopter test system developed by a group of Italian institutions lead by INAF has been key in our in-field characterization of antenna and array beam patterns. 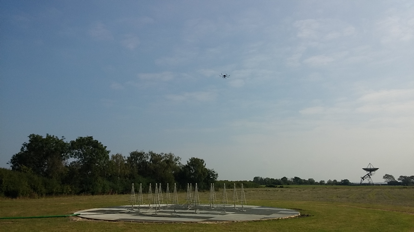 AAVS0 array at the MRAO at Lords Bridge with a hexacopter flying over it. RF-over-fibre (RFoF) technology is the targeted solution for transporting RF signals for the SKA project, where analogue radio signals are transmitted from the antennas directly into the Central Processing Facility via fibre optic media, rather than conventional copper cables. We have performed RFoF module characterisation at our integration lab, as well as conducting field measurements on both the RFoF modules and the fibre optic cable at the Murchison Radio Astronomy Observatory (MRO). 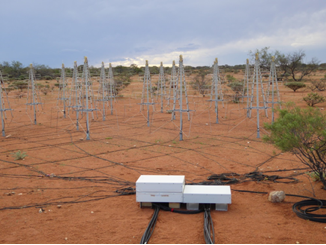 The purpose of these field measurements is to investigate the effects on the RFoF solutions when they are deployed in the hostile Outback environment. There is particular interest in establishing the temperature effects on the properties of the fibre optic cable and the calibration approach to meet the RF system requirements of the SKA. Field deployment of the fibre optic cable at the Murchison Radioastronomy Observatory (MRO). 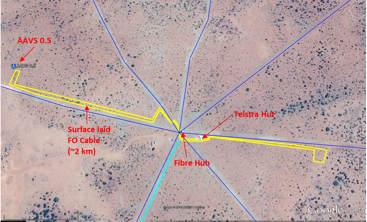 Shown here is the routing of the 2-km surface laid fibre optic cable above the ground. From the field results of the fibre optic cable testing, we found correlation between temperature changes of the fibre optic cable and the phase variation of the RF signals transmitted to it. We have developed physical models of the fibre cable to describe our results, and have derived a few equations that can be used to estimate the implication of changing a few cable parameters, such as cable length, observation time and calibration interval on the phase variations of the transmitted signal. This analysis provides valuable information for the strategies selecting the cable, planning the cable routing into the field, as well as designing the radio receiver station layout. We have also characterised the gain and phase stability of the analogue signal transmitted over a 5.5-km buried fibre optic cable at the MRO site that is then looped-back to form the 11-km transmission. The data could then be used to validate previous measurement results, as well as estimating the phase stability when the cable length is extended to 50 km. Good quality of semiconductor laser sources used presently, which can be tailored in order to produce various optical carriers (practically at any desired wavelength between 1300 nm and 1600 nm). Low signal attenuation and the huge bandwidth that is available when optical fibre is used (attenuation in the range of 0.25dB/km to 0.4dB/km). These results so far demonstrate the viability of RFoF technology for RF signal transport for SKA-low. We have developed a deeper understanding of RFoF technology for analogue signal transport for uses in the Australian outdoor environment, in particular at the MRO. The field measurement and the analysis of the results provide critical inputs for the Aperture Array Design Consortium (AADC) and for the deployment of RFoF technology on behalf of the LFAA.